Tamilnadu Secretariat Recruitment 2018 Application Form For Sation Worker, Sweeper Posts invited by TN State Government to fill the 14 empty vacancies with suitable candidates. 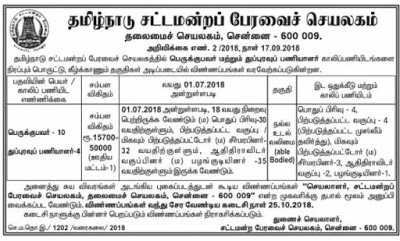 So who are live at Tamilnadu State they are eligible to apply TN Secretariat Jobs 2018. The candidates going to apply following govt jobs check complete prospectus over these jobs. Also, touch with www.gyananetra.com for latest TN Govt Jobs 2018-19. TN State government released the Secretariate Recruitment 2018 and invites offline mode of application forms from 26th September 2018. Candidates do you have suitable qualifications without the second thought apply these vacancies as per the schedule & follow our portal for TN Secretariat Results 2018 or Merit List, Selection List & Cut Off Marks.